If wearable tech wasn't a burning innovation all by itself, there's new technology emerging on nearly every front. From battery life to screen tech and the operating systems our wearables run on, innovation is happening at an unprecedented rate. That's why we at Wareable have sat down to decide on their top wearable innovations that have the power to turn the next generation of devices into true gamechangers. Google Cardboard went pretty much unnoticed with all the Android Wear details grabbing the attention at I/O back in March, but it's a platform that has kickstarted a new genre of mobile VR experiences. Samsung, Archos and even Carl Zeiss now have their own smartphone powered VR headsets available and the amount of apps and experiences is growing by the day. In the same way that the hugely successful mobile gaming industry compliments its console cousins, we're going to see a wave of mobile VR experiences to sit side-by-side with 'core' (i.e. big and expensive) titles appearing on Oculus Rift and Project Morpheus. If there’s an innovation that has the power to really supercharge our wearables, it’s optical heart rate sensing. Found on a series of new devices from the Basis Peak to Fitbit Charge HR, the technology means your pulse can be read via an LED that shines on the shin, detecting the blood pulsing through your veins. Aside from the technology being more convenient for sports fans than the traditional chest strap, the idea of continuous wrist-based tracking is set to transform our wearable data. With heart rate information, wearables can accurately track your calorific burn and sleep cycles, rather than guess from arm movements. 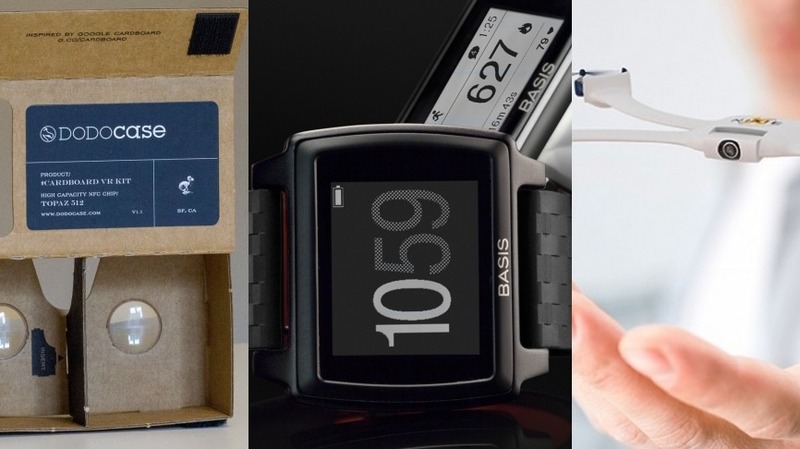 It’s going to transform wearables in 2015, but started right here in 2014. There’s lots of innovation in smart clothing that will start to pay off in 2015 and 2016 - from biometric sports shirts to “bionic bras”. And all of these will be helped by new fabric circuit boards being tested in Hong Kong that can be washed and dryed safely. If I have to pick one innovation, just for the sheer brainpower behind the project, it’s Nixie. It’s not just a crazy gimmick - watch the video for this wearable camera drone, aimed at rock climbers. When I saw the presentation at Intel’s Make It Wearable final in November I was converted. From the flexible, durable - wearable - form factor to its autonomous flying abilities, Nixie is built from serious tech smarts. The winner of Intel's Make It Wearable competition deserves recognition for its sheer audacity as well as innovation, and is one of the few gadgets in the world of tech in 2014 that warrant the looks of sheer disbelief when explained to the uninitiated. "A drone that you wear? Get out of town." Nixie is so 2014 it makes our brains hurt, and a true wearable technology innovation.